RFBAQ - Autumn-Winter 2019 Smoke Signals - Out now! Autumn-Winter 2019 Smoke Signals - Out now! Announcements |	Autumn-Winter 2019 Smoke Signals - Out now! 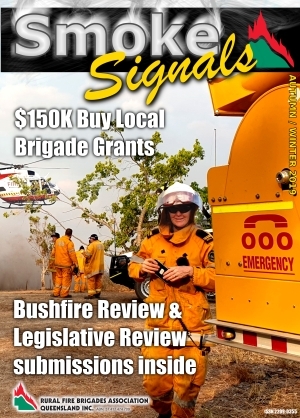 Read the great news about the Bushfire and Legislative Review, 100 Communication Grants coming to a close, a new $150,000 grant process for all brigades and heaps more…..
Online flip book available now + 2 hard copies to each brigade secretary will arrive in the mail over the next week.